This article expresses the way I’ve learned to read and study the Bible. 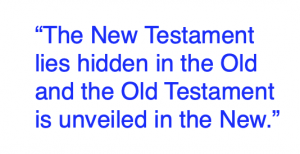 People often ask me how I discovered typology and the ability to see the New Testament in the Old; and the Old in the New. This article opens a crack in the door to the stunning world of biblical study and enjoyment as the Church in earlier centuries knew by instinct but unfortunately lost in the last few centuries. The great upheavals of religious and theological knowledge over the last two centuries began with the question of how to read Scripture. The new science of geology seemed to call into question a literal reading of Genesis, which seemed to date the earth as about 6,000 years old. 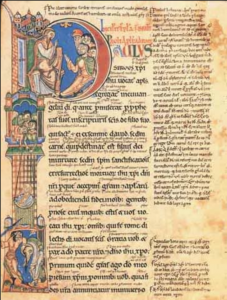 Then, along came the historical-critical endeavors of the German Higher Criticism, and the books of the Bible fell to pieces – thousands of them, fragments by various hands drawn together over centuries, so that Holy Scripture seemed to be a patch job and less than the sum of its parts. How could you determine a meaning when every book was a weave of earlier, perhaps conflicting intentions? How could you trust what was given, if the book did not seem to be providing reliable historical data by which to pin down places and dates? But to those of us who have read T.S. Eliot’s poem The Waste Land, it seems odd indeed. The poem consists of 432 lines, of which at least 100 are full or partial quotations from various sources. That does not stop us from discovering coherent meaning in the poem; to the contrary, the poem gains in depth and significance by Eliot’s deliberate inclusion of other voices. If Eliot could do it, so can God. Jewish and, later, Christian interpretations of Scripture have traditionally and consistently been “figural” or spiritual. By that was meant that, yes, every work has its literal sense, meaning in some cases, a historical event occurring, and in every case, the meaning intended by the author writing. But, every work also has its spiritual sense, a figural meaning that likely is not intended by the author, but which can be discerned within the author’s words and is generally of far greater significance. Only in this way does Scripture become prophetic and revelatory, teaching us something we could not have learned for ourselves, and calling us to sudden conversion. Only in this way can we read the Old Testament as pointing to Christ as its fulfillment. 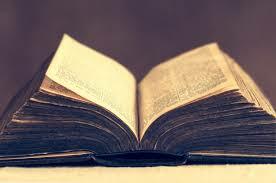 And conversely, only in this way can we read Christ Himself as the lens through which to interpret the words of the Old Testament and the book of nature. We can hardly understand either Testament without the spiritual sense, for the most cursory reading of any passage reveals an economy of language made possible only by a density of meaning: if you are not willing to unpack each sentence like a steamer trunk, then you are not ready to read. Two of the greatest theologians of the twentieth century spent their careers trying to help the Church recover this way of reading Scripture – and, no less, of reading the world. 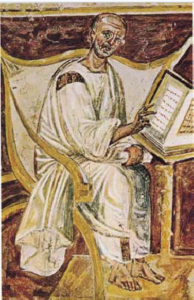 Henri de Lubac’s four-volume Medieval Exegesis is concerned with describing the practice of figural interpretation as it had historically been practiced. It can seem a bit odd to read what you might call a historical-critical defense of figural interpretation; what de Lubac mostly did was outline a brief but elegant theory and then multiply quotations from the Church Fathers until it became clear that his theory was theirs. Hans Urs von Balthasar was a bit more sanguine and ambitious than de Lubac. He too could multiply quotations, but he also just went ahead and interpreted Scripture – and the rest of history – in spiritual terms. De Lubac wanted to restore interpretive authority to the Fathers of the Church; von Balthasar wrote like a Father. This has not stopped the Church from remaining concerned that many believe that historical criticism is the only “scientific” way to read Scripture and that, to modern man, figural interpretation just looks arbitrary or silly. I’ve spent the better part of two decades reading and writing about figural exegesis, and actually practicing it. But all thought of theory flees when I consider just two moments from the last several years. One summer, I decided to read St. Augustine’s The City of God, often called the great saint’s masterpiece, and it surely must be if you judge by sheer length. For most readers, it will be of uneven interest compared with his Confessions, which – to me – is the singularly perfect book of our tradition outside Scripture. I find much to admire in City and much that changed me, but mostly in a scholarly sense. I am impressed by how Augustine developed or refuted some aspect of classical thought on his way to showing us the truth about things. But, late in the book, indeed during a long stretch that would tempt most readers to abandon ship, Augustine describes Noah’s Ark. He patiently describes the dimensions of the Ark, the position of the door in its side. And then he shows us that it is proportionate, at great scale, to Christ’s own body, whose own side would pour out water and blood from its pierced doorway. 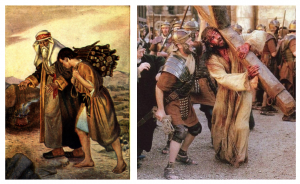 Isaac carrying the wood up the mountain is a picture of Jesus who carried His cross up the hill to Calvary, to offer himself for the sins of the world. Although God saved Abraham’s son, for love of us He did not save his own Son from death. Yes, yes, yes! Isaac anticipates Christ; the son bearing wood is a prophecy, a type, of the Son bearing the Cross. I felt myself draw nearer to God and enter into his mystery even as the kids sat there in my lap. That’s how figural exegesis works; it doesn’t take us back to a particular historical moment. It allows God to reach out and grab us by the lapels – and shake us into faith. Contrary to the bogus claims of some anti-Catholic Protestant polemicists I have run across, Catholics are not at all obliged to read the New American Bible translation (nor the revised English Vulgate, such as the Ronald Knox translation). My own preferred translation is the Revised Standard Version (RSV), which has been approved in a Catholic edition with extremely few clarifications (I think it is only something like three passages that were deemed too biased to be acceptable to Catholics). I read the whole Bible (twice) as a Protestant in the NASB and KJV. I enjoy Phillips, NEB, Williams, and Barclay for paraphrased versions, and the NKJV is pretty cool too (I like the old KJV style, but purged of archaisms). I edited my own “version” of the New Testament (technically, a “selection”), based on use of several existing translations (Victorian King James Bible). When Pius XII issued his Encyclical Divino Afflante Spiritu in 1943, the door was opened for new Catholic translations that were not dependent on St. Jerome’s Latin Vulgate. Because of the great increase in the knowledge of the ancient biblical languages, official translations directly from them were encouraged . . . The Revised Standard Version is the least interpretative of all . . . The Jerusalem Bible and the New English Bible strive for even more contemporary language . . . The New American Bible . . . is the first American Catholic translation to have been based on the original languages, or on the earliest existing form of the text, rather than on the Vulgate. Nor is it forbidden by the decree of the Council of Trent to make translations into the vulgar tongue, even directly from the original texts themselves . . . So that takes care of use of different translations. Nor do Catholics have to interpret every verse of the Bible according to some dogmatic proclamation of the Church. This is another ridiculous (and highly annoying) myth that we hear all the time. Indeed, the orthodox, faithful Catholic must interpret doctrines he derives from Scripture in accordance with the Church and tradition, but so what? The Catholic commentator is bound to adhere to the interpretation of texts which the Church has defined either expressly or implicitly. The number of these texts is small, so that the commentator can easily avoid any transgression of this principle. Catholics are allowed to translate from the Greek, according to the latest textual and archaeological knowledge, to use different translations, and to even cooperate in ecumenical translation projects, such as the RSV and NEB. We can do all the stuff that Protestant biblical exegetes do. And I am allowed to freely interpret almost any text on its own, provided I don’t go against a dogma of the Church (I couldn’t, e.g., say that John 1:1 does not teach the deity and Godhood of Jesus). Many people think the Church has an official “party line” about every sentence in the Bible. In fact, only a handful of passages have been definitively interpreted. The Church does interpret many passages in Scripture to guide her teaching. Other passages are used as the starting point and support of doctrine or moral teaching, but only these few have been “defined” in the strict sense of the word. Even in these few cases the Church is only defending traditional doctrine and morals. It is important to realize that the parameters set by the definitions are all negative, that is, they point out what cannot be denied about the meaning of a passage but do not limit how much more the passage can be interpreted to say. In other words, the Church condemns denials of a specific interpretation of the text, without condemning meanings over and above but not contradictory to it. All of the following passages were definitively interpreted by the Church at the Council of Trent, for each has to do with justification or the sacraments, issues that divided Catholics and Protestants. The Church condemned the denial that the words of Jesus mean that real (natural) water must be used for a valid baptism. At the time, the Anabaptists contended that water baptism was unnecessary because the mention of water was merely a metaphor. Other symbolic meanings in addition to the literal sense of real water can be found in the text, perhaps, but none are acceptable that deny the need for real water at baptism. The Church condemned the interpretation of these passages that denied that Jesus, in commanding his apostles to “Do this in memory of me” after instituting the Eucharist, conferred priestly ordination on them and their successors enabling them to offer His body and blood. More could be understood by the command to do this in remembrance, but that much could not be denied or contradicted by other interpretations. The Church condemned the denial that in these two passages Jesus conferred a power exclusively on the apostles authorizing them and their successors in the priestly office to forgive sins in God’s name, and condemned the proposal that everyone could forgive sins in this sense. The Church condemned the denial of original sin to which all mankind is subject and which baptism remits, citing this passage to be understood in that sense. Definitively interpreting these passages, the Church condemned the denial that the sacrament of the anointing of the sick was instituted by Christ and promulgated by the apostles against those who deemed it a human invention of the later Church. In addition, the decree of Vatican I about Christ establishing Peter as head of the Church — which cites Mt 16:16 and John 1:42 — is a defined doctrine, even though the phrasing about the use and interpretation of the scripture cited is more implicit than explicit, by comparison with the above Scripture passages. Bible Study: Playground or Minefield? Imagine children running and tussling unsupervised in a playground. 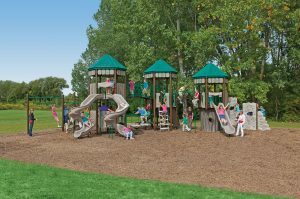 Now imagine the playground surrounded by deadly dangers: a sharp cliff dropping down a thousand feet to one side, a field of land mines, poisonous snakes in the sand, and a bog of quicksand on the other sides. With anguish you watch the children decimated as they fall prey to the dangers around them. They plunge from the cliff to the rocks below, are screaming from the bite of vipers and are gasping for air as they sink in the quicksand. Now imagine the same children playing in the same playground, but now they are carefully supervised and the area is surrounded by a chain-link fence. To be in danger now a child would have to disregard all the rules, disobey the supervisors and climb over the fence. You relax, a sigh of relief passes your lips, and you begin to chuckle at the children’s antics. This is an analogy of Bible study. Two recent misconceptions have plagued Catholics. Ask around and find out for yourself. The average Catholic in the average parish frequently accepts two unhappy fallacies. First, that Catholics aren’t supposed to read the Bible since it is not important or they fear they will invariably misinterpret it and end up confused. Second, they may associate Bible study with Protestantism. Well, isn’t the Bible hard to understand? Aren’t Catholics forbidden to read the Bible? Shouldn’t we leave Scripture study to priests and religious? If laymen study the Bible, don’t they interpret it incorrectly and go off the deep end? This sounds strange to us ex-Fundamentalists because it was the love and study of the Bible that brought us into the Catholic Church. Yet, this subtle fear prevents many Catholics from dusting off the family Bible and making a go at personal study. Our imagined playground, fraught with dangers, illustrates the situation nicely. Are there real dangers associated with studying the Bible? Do pitfalls lie to the left and right? Yes, of course. The fear is not without foundation. Survey the landscape of Christian history and you will see well-meaning individuals and groups strewn in every direction. The carnage and division brought about by the “Bible-only” theology is apparent for everyone to see. Yet we also see many who have loved the Bible deeply, studied it studiously, and have done so without casualties. They have reached the dizzying heights of biblical study and through it have grown to love Jesus and the Catholic Church with ever deepening ardor. What differentiates the two? Why do some stumble and fall by the wayside, while others “play” with a joyful, utter abandon—almost carefree in their study of Scriptures—and, seemingly, with no fear of falling? The fence and the supervision make all the difference. They provide a barrier between the children and destruction. They allow the child to frolic with carefree abandon. What do the fence and the supervision represent in our illustration? The fence is the Sacred Tradition preserved in the Church and the supervision is the magisterium of the Catholic Church. These two things—readily available to any who desire them—are what makes the difference. The dangers are real, but the protections and guidance provided by Jesus in his Church are just as real. Those who stay within the fence and yield to the supervision will study the Scriptures with great benefit, and I may add, with deep joy and pleasure. It is high time that Catholics wake up and discover the riches that have been deposited in their account. The Bible is a gift from God. The treasure is ready for withdrawal! Dust off the Bibles, cast aside paralyzing fears, learn the basic rules of biblical interpretation, observe the protective parameters of Church teaching, and frolic to your heart’s content! What does the Church teach about personal Bible study (CCC 133)? What kind of access or restriction should be placed on Catholics regarding the Bible (CCC 131)? How does the Bible speak of itself and its use by God’s people (Rom 15:4; 2 Tim 3:14–17)? Read Psalm 119. What is the Psalmist’s theme and passion? What value does the Psalmist place on the Scriptures in Psalm 19:7–11? Is the Bible the only source of God’s revelation (1 Thes 2:13; 2 Thes 2:15; CCC 80–82)? Even though the Sadducees studied the Scriptures assiduously, what did Jesus say of them (Mk 12:24)? Do the Scriptures always have a plain meaning and are they always easy to understand (2 Pet 3:15–17; Acts 8:29–31)? Based on these verses, is everyone’s understanding of Scripture equally valid? Does everyone have the same ability to understand the Scriptures (Heb 5:11)? Should individuals research the Scriptures for themselves (Acts 17:11)? Is the interpretation of the Bible ultimately left up to each individual and what place does “private interpretation” have in the interpretation of Scripture (2 Pet 1:20)? Where does authoritative interpretation of Scripture have its source (CCC 84, 85, 95)? Who has the ultimate right to protect and interpret the Bible (CCC 119; Acts 20:27–31; Titus 1:9)? What is the “pillar and foundation of the truth” (1 Tim 3:14–15)? Who or what has judicial authority over a believer (Mt 18:17)? How are the faithful to respond to the protective teaching authority of the Church (CCC 87, 88). Ready to Start Studying the Bible in 2019? It’s Time to Prepare Now! The Bible out of Context: “Saved by Faith Alone”? Can Peter Walk on Water? Can Sinful Men be Infallible? Should Catholics Attend Non-denominational or Ecumenical Bible Studies? Which Translation of the Bible Should I Use? Sherlock Holmes: Is this a Real Bible Study? Dangerous Playground or Safe Bible Study? Did the Bible Always have Chapters & Verses?